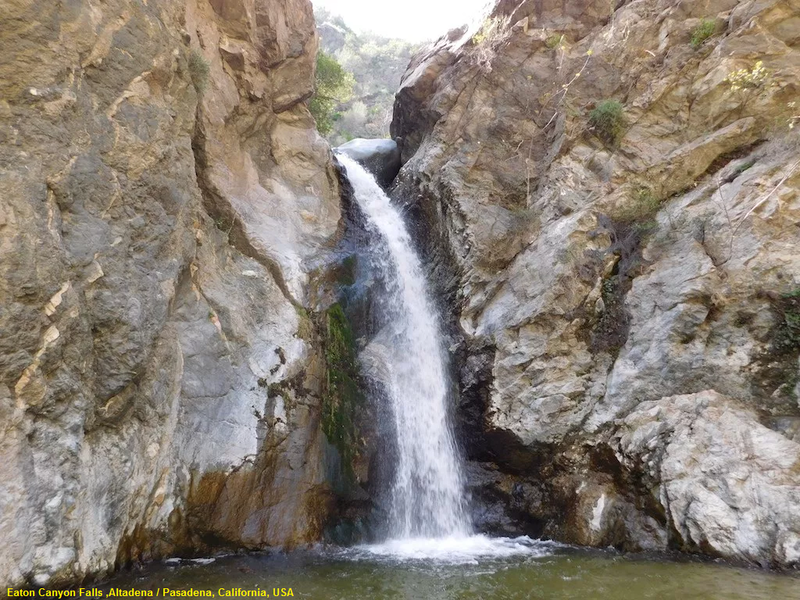 The 40 foot waterfall in Eaton Canyon fills an amphitheater at the top of Eaton Canyon Trail, tumbling into a wide pool that you can rest alongside or wade in. The waist-deep water is so refreshing, you are likely to see hikers in bathing suits on a warm day. The hike to Eaton Canyon Falls can be summed up this way: 1.1 miles of wide flat, relatively uneventful dirt trail, followed by 0.65 miles of single track up a narrow canyon that is adventurous and fun (forming a 3.5 mile round trip hike with 375 feet of elevation gain). If you’re lucky enough to hike this area during the springtime, you may also get to see some great blooms near the trailhead. The lower stretches of this trail are pretty level, and wind through some brush and chaparral on the way to Eaton Canyon Creek. After that, it’s easy fire road hiking as the route follows just above the banks of the wide, rocky wash of the actual creek. Here, the trail gets a bit more verdant, and you may be able to spot a few more wildflower blooms along the way. At about 0.6 miles, veer left on the Eaton Canyon Trail, heading toward the sign marked WATERFALL. It’s pretty clear. At just about the 1.2 mile mark, you’ll reach another junction, in sight of a concrete bridge. Here, head left again and follow the trail as it descends from the wider track and dips beneath the bridge. From here on out, the trail is single-track, rocky, and prone to crossing the creek a LOT. So get your balance ready, or make sure that extra pair of socks is secure in your pack, then continue on. At about the 1.8 mile mark, you’ll make a sharp bend in the canyon, turning west, and get your first view of the falls. From there, it’s just two more rocky crossings and then you’re there. Hopefully, you’ll be able to get a little bit of peace and quiet to yourself but even if it’s crowded, you’ll be able to enjoy the sight and sounds of falling water and the feeling of cool mist. They’re naturally relaxing, and if it’s hot, you can even take a dip in a small pool at the base of the falls.